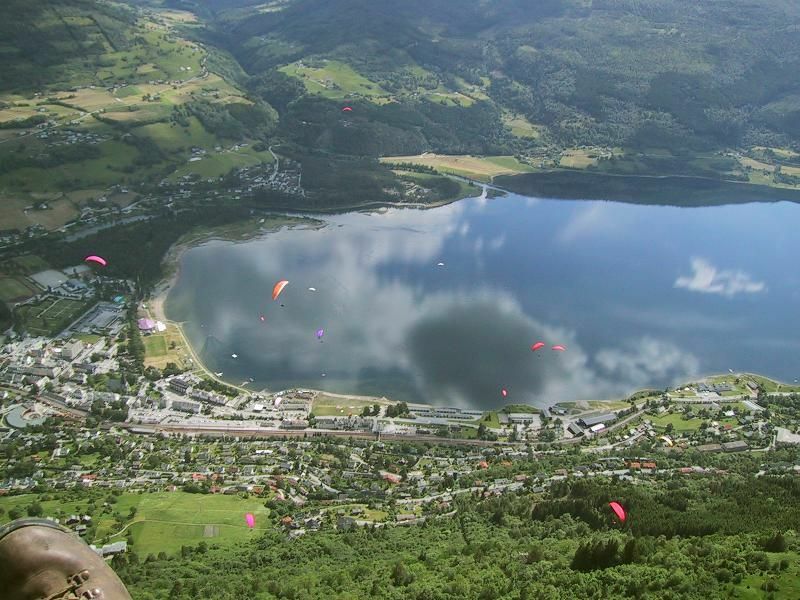 Voss is one of the most famous flying sites in Norway. This breathtaking area is situated in Northern Norway, about one hour driving from Bergen. The most frequently used site is Hanguren, which is also suitable for acro. It’s accessible by cable car from the centre of Voss (Hangursbanen) and it costs about 8 euro. The startplace is approximately 100 meters far to the east from the station at 620 meters ASL (height difference is 570 meters). The take off is smooth grassy slope, the optimal wind direction is south and by this the thermals are very nice from march to september. Sometimes it’s possible to start in weak northern winds by lee thermals but it can be quite risky. Dangers: Pay attention for the cables of the cable car, to the right from the take off. In June the seabreeze starts to became troublesome and give sidewind in the afternoon. Usually it’s 5-6 m/s strong but rarely it can be even 10 m/s. Watch the surface of the lake to see when the seabreeze starts to built up. During warm summer days the lakeside can be crowded by bathers. In this case, you can land next to the the estuary of the river (at the corner of the lake, called Grandane). There are many other startplaces at the area but mostly for cross country flying. Do you have a cool footage about Voss? Do you know about an event related to Voss? Part of the Ekstremsportveko, FAI2 & Acro World Tour Qualification stage 1. Registration: After the opening ceremony on 24/6 at the minigolfen cafe and 08:00 on 25/6 at the minigolfen cafe. Vertigo Voss acro competition during the Extremsportveko multi-sport event. As the part of the great Extremesportsweek event this competition started in 2002 and since then it’s held every year hosted by the sportive little town of Voss.